The Future Automation QA2 is available in two different models catering for screens up to 80". The QA2 is made for screen sizes 40" up to 60" then the QA2-60 is designed for larger flat screen sizes up to 80". 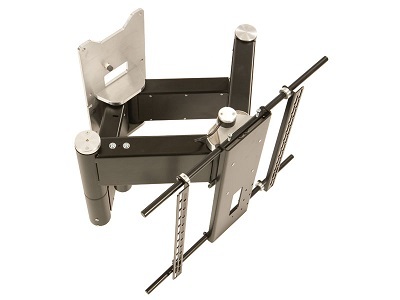 The Quad Arm is the most elaborate and advanced motorised TV wall mount offered on the market the motion is both intelligent and elegant. The TV is extended directly outward so it is stood of the wall allowing 150 degrees rotation. This step out functionality is particularly useful for recessed TV installations of for inside alcoves allowing the screen to be extended in parallel. Both models of the QA2 offer a quiet smooth motion and come complete with remote control. Full cable management coupled with a sleek modern design makes this a truly innovative unique product offering. Parallel Track for beautifully tight recessed finish.